All about the Veracocha and DJ Taucher remixes for me! A bit of useful (or useless) trivia. The Veracocha remix of this tune would soon appear on a McDonalds advert here in the UK towards the end of 1999, the year of trance! Observe! How the hell is this more expensive than the vastly superior Ayla? I came to this release page expecting NM/NM copies for £2-3! The original and the Veracocha Remix are top. The latter was dropped all the time during the late-night peaks of the parties I used to go to. This Track owns not without Reason absolute Classic's Status.With his slightly monotonous and hypnotic Rhythms kidnaps it to another Sphere. One will hear the timeless Masterpiece sure still in ten Years. Ambience is like the second Part of the Original Mixes. He has the same Rhythm, but is held even quieter. 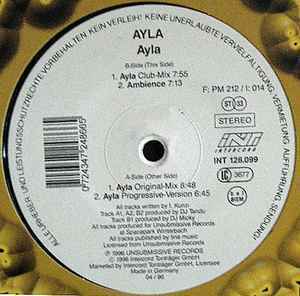 Many Remixes were produced of Ayla. The best known is the Dj Taucher Remix, which was even more Successful than the Original.In support of the Success of Ayla produced Dj Tandu even other Titles under this Pseudonym. Indeed, not with comparable Result. Sorry but this has to be a one line comment. If you have never heard this tune then it's a must. It transports you to another level altogether. Out of this world.